MSRP: Starting at $88,853 USD. 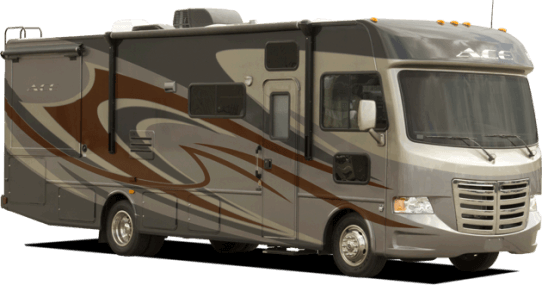 The Thor Motorhome’s 2014 A.C.E. is compact with a streamlined profile. Externally, the A.C.E., which measures out at 29 feet 7 inches, still retains the appearance of a Class A, but borrows a bit of Class C with its distinctive front eyebrow ridge above a downsized, one-piece windshield. Added to this is an eye-catching chrome grille that opens for easy access to the engine compartment, and an attractive basic graphics package over white, gelcoat fiberglass side walls. Altogether, the smart-looking coach with front and rear molded end caps, plus a rigid steel rear bumper, sets a new Class A standard in form as well as curb appeal. 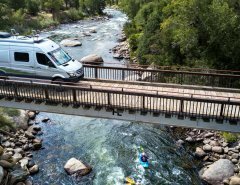 While the base price is lower than your average Class A RV, there is a full complement of necessary amenities and self-containment features needed for long-term travel and livability. Even as an entry-level model, the A.C.E. 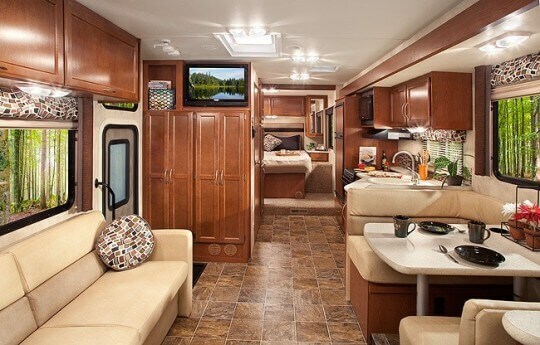 still has many standard features including a 24-inch LCD TV with swing-out arm in the living area, a china toilet, outside shower and electric drop-down bunk that adds significantly to its residential utility. 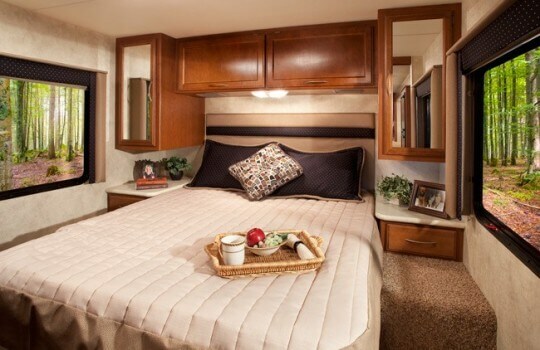 A spacious, well-executed floor plan with lots of amenities, makes this pet friendly RV feel homey with many hotel-like features. Well thought-out Class A and C combined floor plan, utilizing every nook and cranny as functional space, eye appeal and price are the key priorities and ingredients for this unique model. This A.C.E. 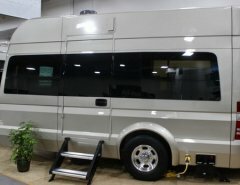 EVO 29.2 is 29’7” in length with an 84” interior height, making it shorter than some Class C motorhomes and increasing the maneuverability. The kitchen is well designed with ample cabinet storage, a pull out sliding pantry keeps canned goods away, keeping those items protected in travel. There is a 3 burner stove, microwave, full sink with high faucet and ample counter area. The kitchen maximizes storage for utensils, pots, pans and everything else with it’s multitude of drawers. The cockpit had the usual Class A roominess and feel about it, with the exception of a narrower, one-piece windshield. Surprisingly, this feature provided sufficient forward and peripheral views of our surroundings with no adverse effects, and proved to be an excellent departure from traditional Class A glass that often tends to let in much more heat and sunlight than one might want.” A safety window on passenger side is both functional for improved driving and parking viewing as well as a “doggie window” for your pet to view the outside. 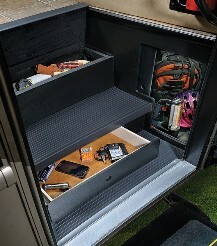 Co-pilot workstation flips over from dash to provide a desk area for your technology, deck of cards or Sudoku, and power for phones, tablets and computer. 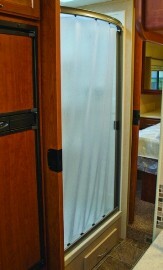 Curved, hotel-like curtain rod with an anti-bacterial curtain for a no-mold clean and a corner shower caddy for all of your shower needs. A generous counter and ample cabinet space for abundant linen and towel storage. An additional linen closet is located in the hallway next to the bathroom. A full bedroom is in the back of the A.C.E. with 2 wardrobes for generous storage. 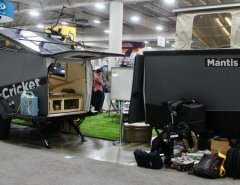 Sleep options are many with an electric drop down bunk over the driver cockpit, a convertible sleep sofa with no gap when flattened, and kitchen benches that flatten for sleeping. Great for parents with kids and their friends. Even the appliances and safety were considered. 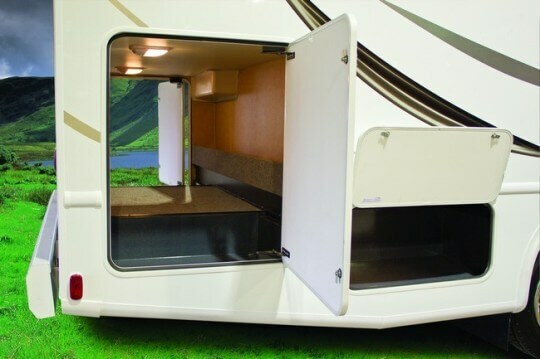 Hot appliances like the furnace and water heater are strategically located away from the camping area and placed “below floor”, protecting kids and pets from the possibility of getting burned, as well as reducing noise intrusion inside the coach. Avoid the tripping hazard created by a pet’s leash when attached to the entry handle, by using the A.C.E.’s Pet-Link security tie down point. 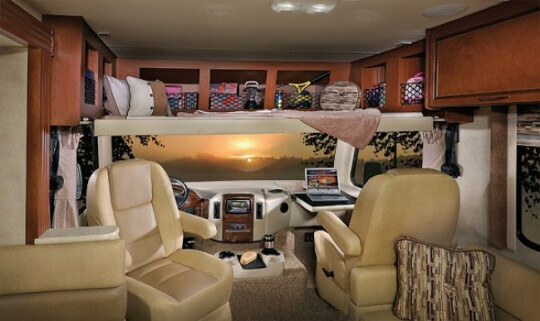 Hidden inside the passenger side compartment, it also gives you somewhere to attach bikes and camping gear for the night. Check out the manufacturer’s website for more complete information.